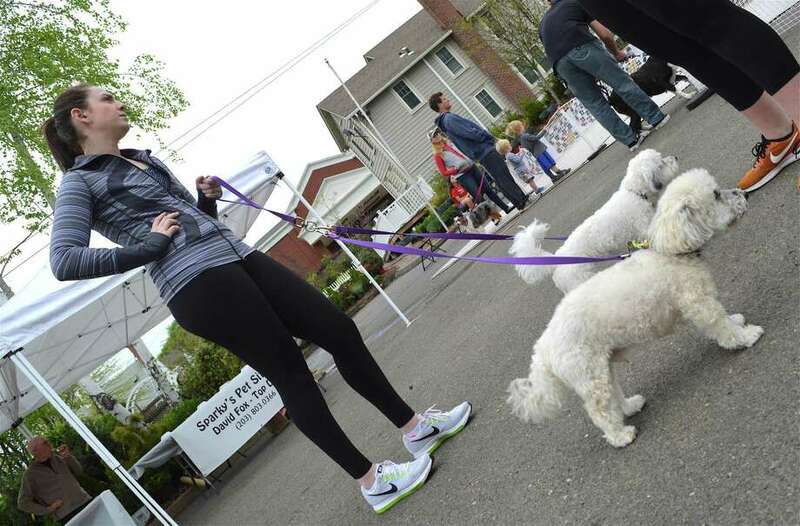 Allie Potenza of New Canaan and her dogs, Sadie and Harley, watch the happenings at the 9th annual New Canaan Dog Days of Summer event at Pet Pantry Warehouse, Sunday, May 6, 2018, in New Canaan, Conn.
NEW CANAAN — A large, playful pack of canines came out to Grove Street Sunday afternoon to enjoy the 9th annual Dog Days of Summer and help raise some funds for their comrades. “The whole thing is a fundraiser,” said Emery Kriegsman, general manager for Pet Pantry Warehouse, which organized the event. A range of dog vendors were on hand, along with the two animal adoption agencies Adopt-a-Dog and Strays & Others, which were the recipients of the fundraising. There were activities for dogs, including a Doggie Fun Zone, free giveaways, and lots of animal interaction. There were also several animal ambassadors on hand from the New Canaan Nature Center, with executive director Bill Flynn giving a talk.